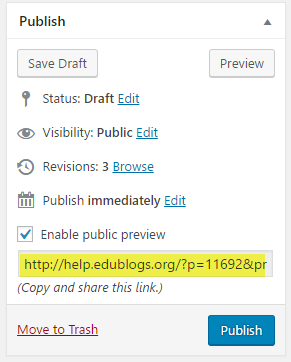 The Public Post Preview plugin enables you to give a link to other people so they can preview your post before it is published without being added as a user to your blog. It’s useful for situations where you are writing a post and need editing help of someone who does not have access to your blog. 4. 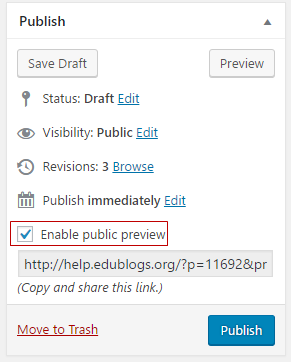 You’ll now see a ‘Enable public preview‘ checkbox on the Publish module. 5. Select the checkbox next to ‘Enable public preview‘. 6. Copy and share the preview link. The preview link remains live for 48 hours. After 48 hours the link expires and you need to copy and share a new link which is automatically generated on the same place on the publish module. 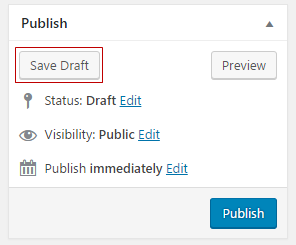 You only see the ‘Enable public preview‘ checkbox on posts that have been saved and haven’t been published.